Just two more Chuckwagon Barbeque and Western Music concerts left this season at Wildlife West Nature Park in Edgewood. This weekend (August 22), the talented Sons of the Rio Grande will perform, and closing the season will be the popular western swing band of Holy Water and Whiskey (August 29). 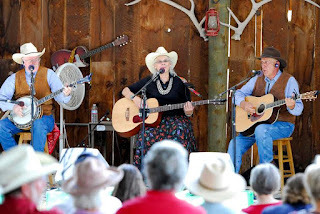 Performances are held in an all-weather amphitheater in an old west atmosphere. The show opens at 6 p.m. with an incredible free-flight Peregrine Falcon demonstration presented by world-renowned falconer Tom Smylie. The audience will experience these magnificent birds close up and learn how the fastest raptor on earth survives in the wild. Come early, enjoy a hayride and get a rare opportunity to be close to wildlife in their natural habitat. It's fun for the entire family. The Chuckwagon shows help to support the native wildlife zoo, which is managed through volunteer support. Dinner shows are $25/adults, $23/seniors, $12/child 5-11, and kids under 5 are free. Reservations are required by 2 p.m. on the day of the show. Call Wildlife West for reservations at 505.281.7655 or toll-free 1.877.981.WILD (9453); or for more informationwww.wildlifewest.org.